I've been busy in the last two days. I didn't have a big job to accomplish or something like this; I just have had too many things to do in only 48 hours. It's a very hot summer and we can barely sleep, and we must switch off the air-conditioning from time to time. This shall be another sultry night here in Rome. I love summer but I just would want a break from the extreme heat. Today (actually, tonight) it's time to shout "Anchors away!" one more time. 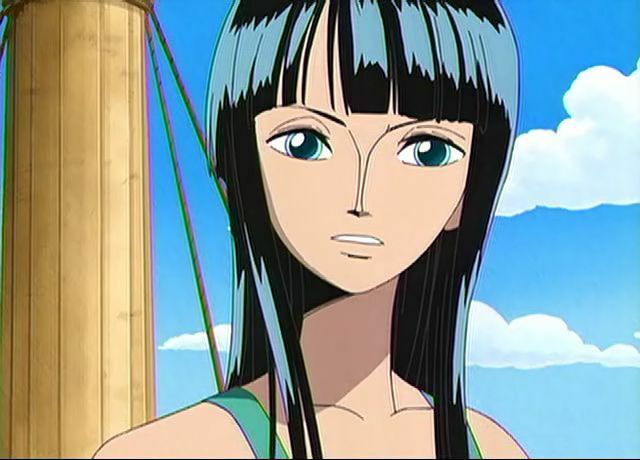 Let's meet the lovely and mysterious Nico Robin. Negli ultimi due giorni sono stata più indaffarata di un uomo con una gamba sola ad una gara di calci in culo. No, sul serio. Mille cose da fare in sole 48 ore. In più, questo caldo belluino mi sta uccidendo. Dormire la notte è un'impresa. E ogni tanto dobbiamo spegnere il condizionatore. Forza e coraggio, ché oggi tocca a Nico Robin salire sul ponte di comando. Salpiamo!! At her first appearance, Nico Robin is called Miss All Sunday and she's the partner of villain Crocodile, aka Mister Zero. She joined Baroque Works for searching around as info as possible about Poneglyph, some ancient stones which is said to tell the world's lost history. 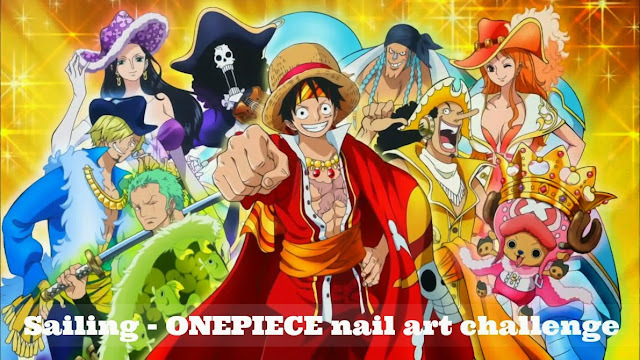 After Crocodile defeat, Robin joins the Strawhat Crew. She's an archaelogist who ate the Flower Flower Fruit when she was 8. Robin's story is very sad. Sha was born on Ohara, where was the world's oldest and largest library. She learned how to read Ponyglyph, but the World Government finds out about these efforts and sends a battlefleet to stop these attempts. Only Robin escapes the devastating attack that claims the lives of the island's entire population, including that of her mother. To survive, she joined many pirates and outlaws, until she met Crocodile and Rufy. To save Mugiwaras, she gives herself up to the World Government, but when Rufy and co tried to save her, she screamed out loud "I want to live!". Because Robin's shade is violet, I made this nail art starting from P2 Cosmetics LE into Lace #020 Lust I've shown you this Sunday. 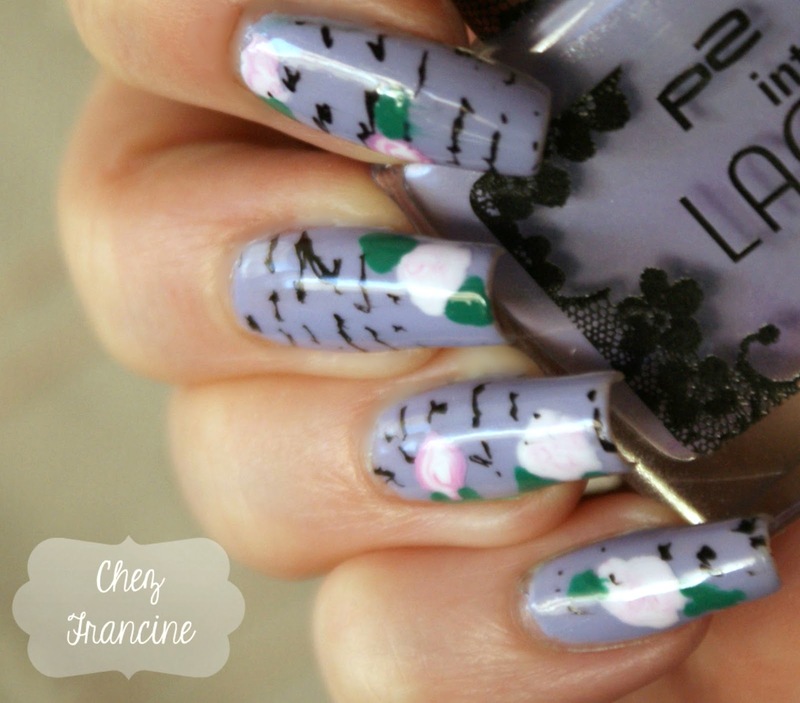 I stamped a writing pattern (From MoYou London The Pro #07 plate) using essence stamp me!black. I made some home-made stickers, painting some irregulars spots over a piece of plastic paper. 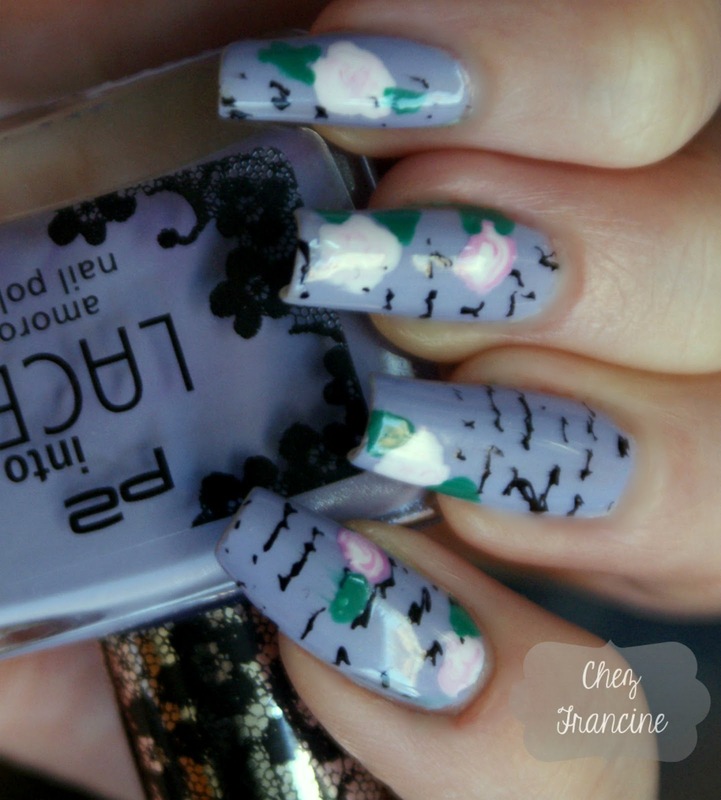 I added some details and a pair of leaves for each rose and I sticked them over my nails and I sealed my nail art with the top coat. Visto che il colore identificativo di Robin è il viola, sono partita dal P2 Cosmetics LE into Lace #020 Lust che vi ho mostrato domenica scorsa. Ho mischiato lo stamping con gli stickers fatti in casa. La plate proviene dalla collezione Pro (#07) di MoYou London e lo smalto che ho usato è il vecchio essence stampme!black. Le rose sono dei cerchi irregolari che ho fatto asciugare su una carpetta di plastica. 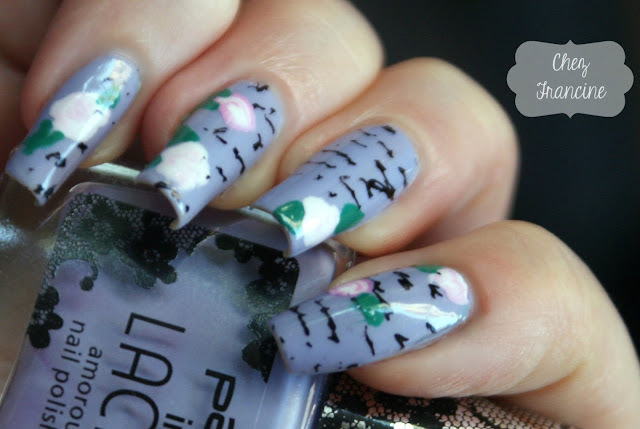 Ho sigillato il tutto con il top coat, et voilà! That's all, mates. I'm sorry but this hot Summer is wearing me out! I hope you liked my nail art and thank you for stopping by! Have a nice (and cool) day/night/whatever. Questo è tutto, per stasera. Scusatemi, ma quest'estate mi sta uccidendo. Spero che la mia idea vi sia piaciuta e che la vostra nottata sia il più fresca possibile. Alla prossima! !